Impact footprint for the asteroid fragment of 2015 PDC, based on the recent radar measurements from NASA’s Goldstone station. The footprint is about 20 km long and 5 km wide and centered over the city of Dhaka, captial of Bangladesh. 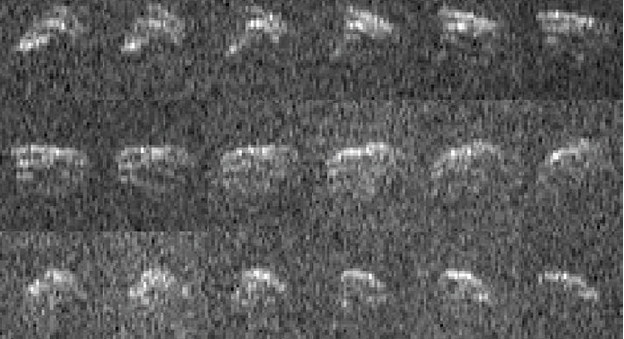 First radar images of the fragment of asteroid 2015 PDC heading for impact with the Earth on Sept. 3, 2022. The object is about 80 meters in size. Impact will occur at about 9:50 am local time. The fragment will enter the atmosphere at 16 km/s at an angle of 36 degrees from horizontal, releasing about 18 Megatons of energy, but a crater-forming impact is very unlikely. The object will almost certainly explode in the atmosphere as an airburst, much like the Tunguska explosion of 1908.